HA NOI (VNS) — VN-Index continued having green colour on its billboard in the last trading session this week by climbing for a second straight day yesterday to narrow the weekly loss as traders were confident about the optimistic market prospect. Traders continued to hunt local shares for margins but the liquidity continued to wane as both buyers and sellers were not pleased with listed prices. The buyer-side wanted higher but the seller-side expected higher price. 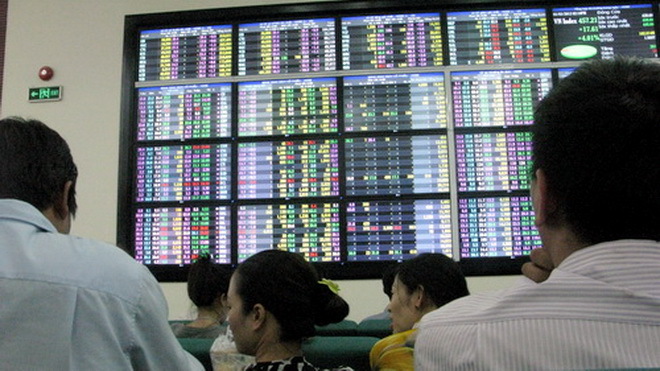 In HCM City Stock Exchange, the VN-Index added 0.7 per cent, to end the day at 594.29. The southern bourse saw 121 advanced, 110 tumbled, 63 closed unchanged. The VN30-Index tracking the southern city's top shares by capitalisation and liquidity gained 0.96 per cent to end at 676.31. The market volume was down 20 per cent from a day earlier, totalling 122 million shares and fund certificates worth VND2.234 trillion (US$105 million), down 10 per cent from yesterday. Large-cap gainers included Masan group (MSN) and Vinamilk surged VND2,500 and VND1,000 per share respectively. While loser included Vingroup (VIC) and Ocean Group (OCG) slid VND500 and VND300 per share respectively. Tan Tao Investment - Industry Corporation (ITA) led the southern bourse with 9.2 million shares changing hands to close flat at VND10,600 per share. Followed by FLC Group (FLC) with 8 million shares. Hoang Quan Consulting Trading Service Real Estate Corporation (HQC) looked up 1 per cent to finish at VND9,800 on a trade of 6.6 million shares. On the Ha Noi Stock Exchange, the HNX-Index advanced 0.54 per cent to settle at 90.04. The market atmosphere was positive but the liquidity plunged as the buyer-side and the seller-side did not meet in a common point - price where the former wanted higher but the latter expected a lower level. Blue-chips continued to play their roles when the market was volatile today. The HNX 30 Index composed of the capital city's largest shares, advanced 0.56 per cent to end at 185. Kim Long Securities (KLS), was most active share with a trade of 9.4 million shares by climbing 4.3 per cent to end at VND14,600 per share. PetroVietnam Construction (PVX), arrived second in liquidity with 6.6 million shares changed hands, leaping 3.1 per cent to settle at VND6,600 per share.